The Bureau of Economic Analysis released new data today showing that corporate profits reached an all-time nominal high in the second quarter of 2013. Profits before tax rose to 12.53 percent of GDP from 12.22 percent in the previous quarter, as the following chart shows. That was just fractionally short of the all-time high of 12.60 percent reached in the final quarter of 2011. At the same time, the BEA confirmed that GDP grew by 2.5 percent, the same as the August estimate. Meanwhile, proprietors’ income was flat in Q2. Popular discussions often treat proprietors’ income as a proxy for the income of small business. It includes the current income of unincorporated businesses that have the legal forms of proprietorships, partnerships, and tax-exempt cooperatives. It does not perfectly match up with small firm size because some small firms are incorporated and some proprietorships, partnerships, and cooperatives are large. In addition to data on GDP and its components, the latest BEA report included new estimates of inflation based on the national income accounts. The broadest measure of inflation, the GDP deflator, grew at just a 0.6 percent annual rate in Q2. 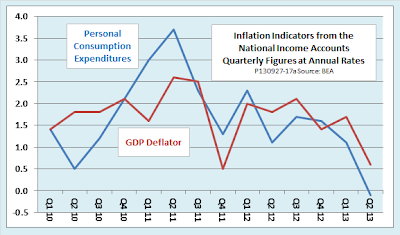 The deflator for personal consumption expenditures, closely watched by the Fed, actually fell at a 0.1 percent annual rate. 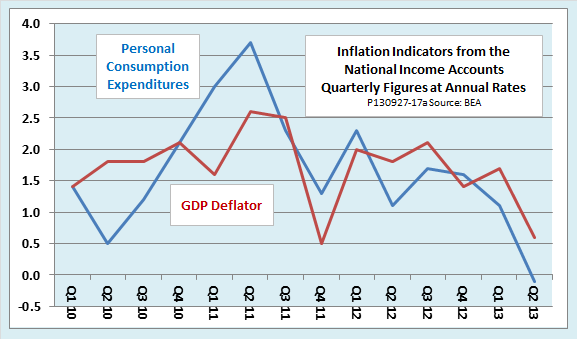 Previously the PCE deflator had been estimated to have been unchanged in the quarter. Overall, the latest report on GDP and its components contained few surprises. Compared with August’s second estimate, today’s third estimate shows the same overall rate of growth of real GDP, at 2.5 percent. Inventory accumulation and the growth of exports were slightly less rapid than previously estimated. Those changes were offset by slightly faster growth of consumer spending and a slightly less rapid decrease in the government’s contribution to GDP. Follow this link to view or download a classroom-ready slideshow with charts of the latest GDP, profits, and inflation data. Whatever Became of the Money Multiplier?